The DHT22 is a fundamental, minimal effort computerized temperature and mugginess sensor. It utilizes a capacitive stickiness sensor and a thermistor to gauge the encompassing air and releases an advanced signal on the input pin (no simple information pins required). Its genuinely easy to utilize, however, requires cautious planning to get information. The main genuine drawback of this sensor is you can just get new information from it once like clockwork, so when utilizing our library, sensor readings can be up to 2 seconds old. 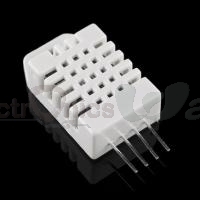 Accompanies a 4.7K - 10K resistor, which you will need to use as a pull-up from the information stick to VCC.